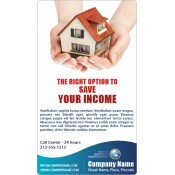 Custom investment magnets make effective advertising tools for financial services that are trying to establish their credibility with minimum efforts. May be you are a stockbroker, investment advisor, investment banker, equity portfolio manager or a Quick Books expert, these customized magnets are simply perfect for you. We offer free full-color printing which will aid you to go lavish with the choice of colors for positioning your contact information. Avail free ground UPS shipping anywhere within the contiguous USA. 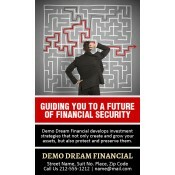 Finance and Investment are two hot terms which never loses their validity. Customer attitudes and expectations from financial institutions are changing. They always want to double check validity and reliability of such institutions. This is why financial services are forced to establish direct contact with their customers to drive their businesses. 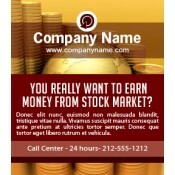 They can now easily do it by combining their marketing strategies with these promotional magnets. Designed over popular sizes of rectangle and square magnets as well as customshaped magnets, financial services can easily find their take. Over the years, financial services have relied upon television advertisements, billboards, signage, flyers, newspaper advertisements and business cards to build credibility around their business. Various studies suggest that most financial (and non-financial businesses) waste 15%-30% marketing dollars on non-resonating advertisements. When every single marketing dollar counts, perhaps there is no room for error. 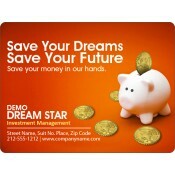 Now, these businesses can minimize their marketing losses and efforts by indulging any of our custom finance magnets. Our advertising magnets not only aid financial businesses to distribute their contact information but also impress their clients with their reliability. Today, with increasing cases of money embezzlement and laundering, people always want to double check their services. They appreciate receiving reliable promotional items which they can refer anytime whenever the need arises. 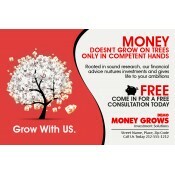 All big and small financial services can order from our selection for bulk giveaways. 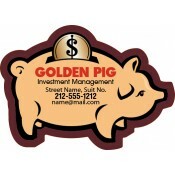 We offer great savings on wholesale orders of these personalized magnets. Financial marketers can avail these financial services fridge magnets for large scale distribution during niche tradeshows, community events, business conventions and more. Save large on art setup and online design proof because their prices are inclusive. These lightweight finance magnets are also perfect for bulk mailing. To know more about these financial services fridge magnets, feel free to contact us at 855-762-4638 or write to us at info@cmagnets.com.